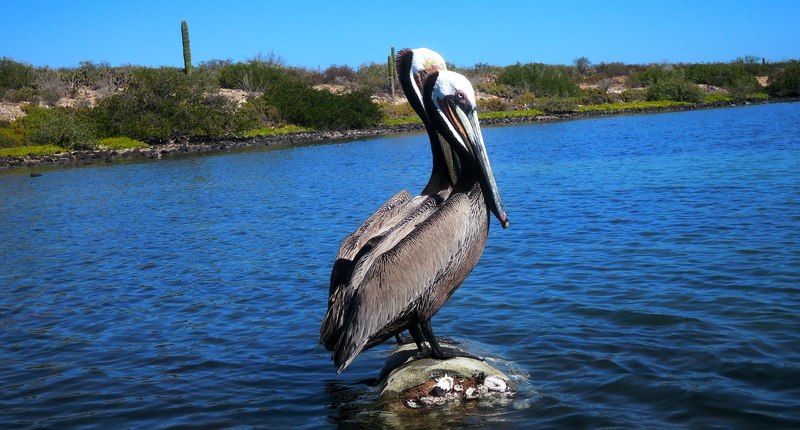 We heard mixed reviews about Todos Santos, that it was a tourist trap and an artist community of “gringos painting their own interpretation of a pelican” but we wanted to form or own opinions of the town. We had marked it on our map we used for planning this trip, chosen because it was on the list of Pueblos Magicos, a promotional campaign by SECTUR to boost tourism in Mexico. We only spent a few hours in the town, wandering in and out of the artist galleries and souvenir shops. Because of the poor economy and the US media saying that Mexico was dangerous, there were few visitors, empty streets making the street vendors a little more pushy with their invitations for us to look inside their shops. It was a cute little town but it was sad to see how hard hit they are by the drop in tourism. I can’t imagine how they survive this! I did purchase a cute necklace while in Todos Santos from a nice young woman and then just down the street, I had Darryl take my photo in front of the “Hotel California” sign although it’s highly unlikely that this hotel has any connection to the Eagles’ song. We stopped at the Cultural Center which had a lot of prints by Frida Kahlo. It also had an almost disturbing number of human skulls on display for reasons that I didn’t understand. The inside looks very modern. The doors are the only element that stand out as historical. Darryl also found these cool patterns and textures to photograph. Close-up of door that we really like. Maybe we can have something like this made for our new home, wherever that might be, when we return. After Todos Santos, we went in search for sleeping arrangements. There was a place on the beach that we wanted to stay but the campground description in our Baja Camping book stated that they require a 3 night minimum. We assumed that because there were so few tourists coming through, they would relax this requirement for us. Well, we we were wrong. But the owner was nice enough to point us to a section of beach where we could stay without being hassled by the police and it would cost only $2. We found the location and spent the rest of the afternoon enjoying the beach, writing, taking photos and watching the crabs scurrying over the rocks and get pummeled by the waves. We later camped at Baja Serena Campground. They had the cutest lab mix puppy and the best showers in all of Baja so far! 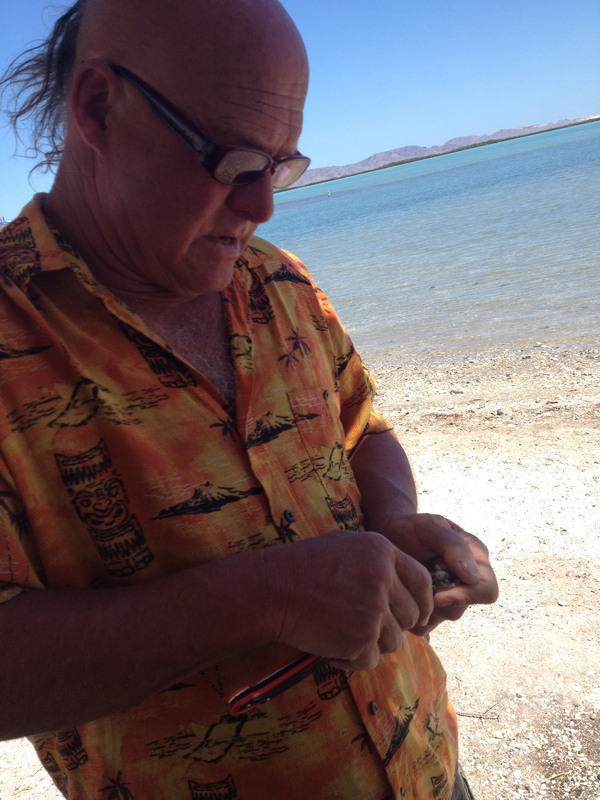 It was at Baja Serena that we met the Canadian commercial fisherman who told us about the table seiners that I included in an earlier post “People are so Nice”. Darryl went in search of photo ops. I spent the time catching up in my travel journal. Darryl found an interesting subject! I love how he captured the different stones in this photo. Pretty fierce looking crab when seen up close! 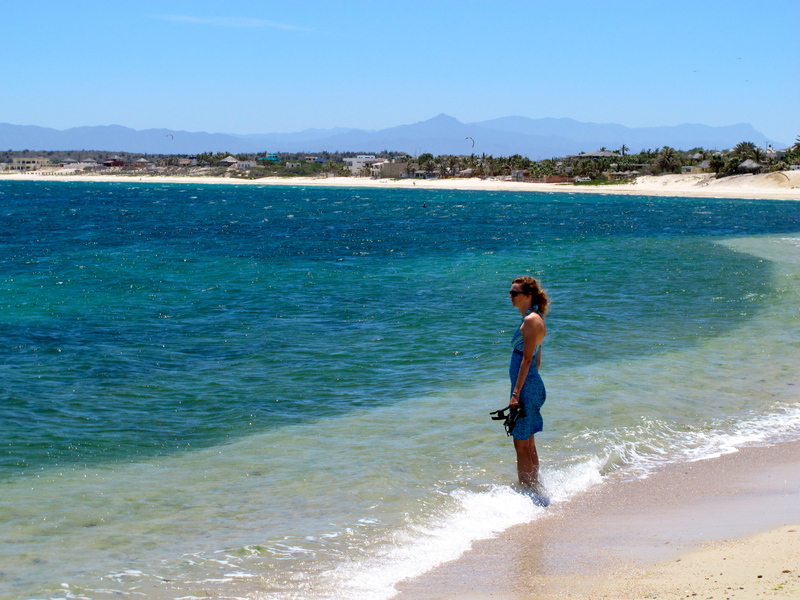 We continued south on Mex 1 to Cabo San Lucas which is at the very tip of Baja California. We had really good tacos at Caffé Amore internet cafe next to Amigos del Mar along the marina. Afterwards, we went in search for the trail that leads to the top of Mount Solmar at Land’s End. Unfortunately, we were denied access to the trail that starts at Solmar Beach on the Pacific side. There is now a resort there and they wouldn’t let us through. So we decided to try to find a path over to Lover’s Beach which required lots of scrambling over rocks going from beach to beach. After some searching, we decided that it was too sketchy to try to scramble to the top, being content to stay along the beautiful beaches. After our day in Cabo San Lucas, which is at the southernmost point of the baja peninsula, we started our journey back north to the US. We will take a different route north but there will be a few towns that we will revisit. We decided to take a break from the roof top tent for the night and stayed at the Posada Real resort in San Jose del Cabo which is just 20 miles north of Cabo. 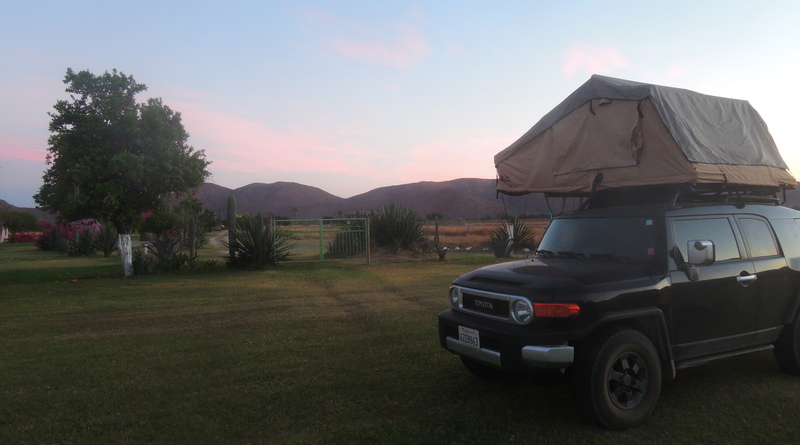 After spending $5-$15 per night in the RV or camping sites throughout Baja, I had a hard time splurging for the fancier resorts so I convinced Darryl to settle on the Posada Real resort which was $185/night. All of the resorts we looked at required that we pay for the all-inclusive option which meant that all of our food and drinks were included. We had no interest in eating at the resorts so this was a little annoying to me. We settled on a smaller resort slotted between the other larger, fancier and more expensive ones. I realized pretty quickly that I should have spent the extra $100. We had to ask for a different room because our first room smelled like cat urine…yuck. 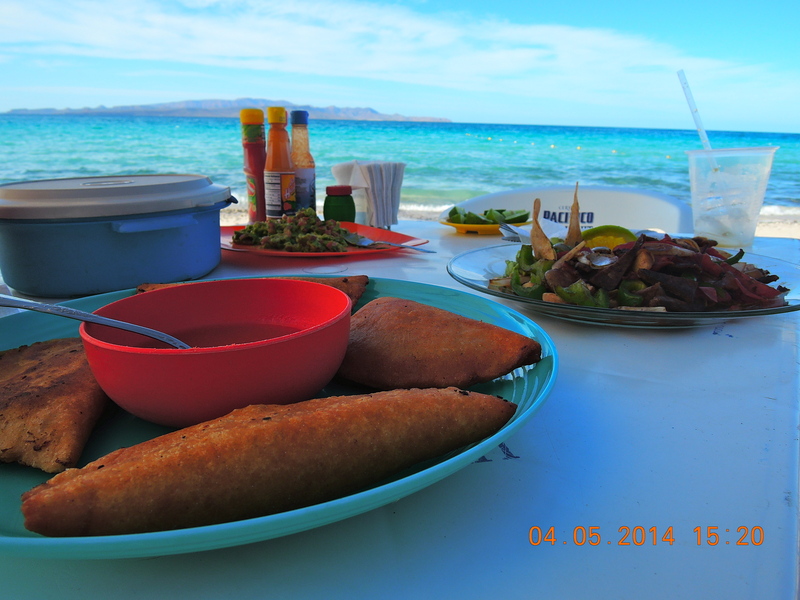 The next day we set out for La Paz but first, we wanted to make a short stop in La Ventana. We heard about this town from Renee and Mark who were on the whale shark tour with us. Along the way we noted a few other places for our next trip to Baja. 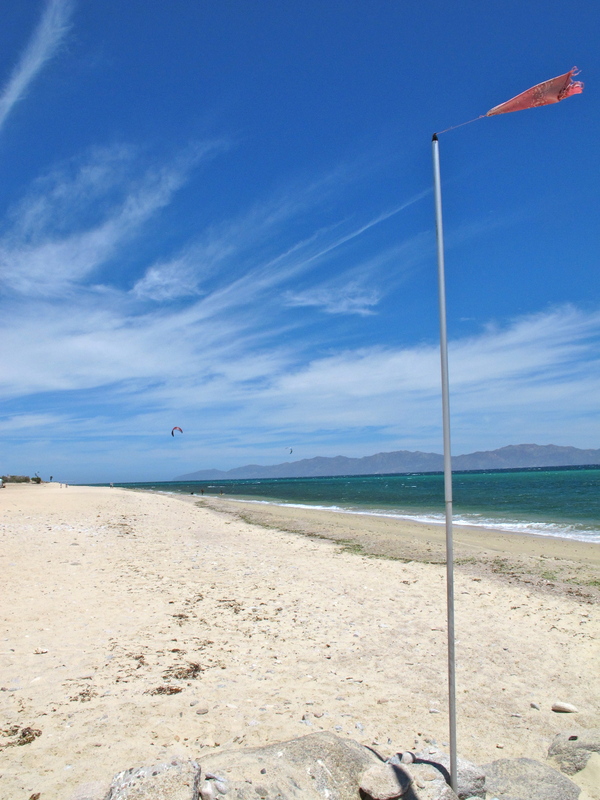 We will add a few days of snorkeling in Cabo Pulmo and / or Aqua Verde. 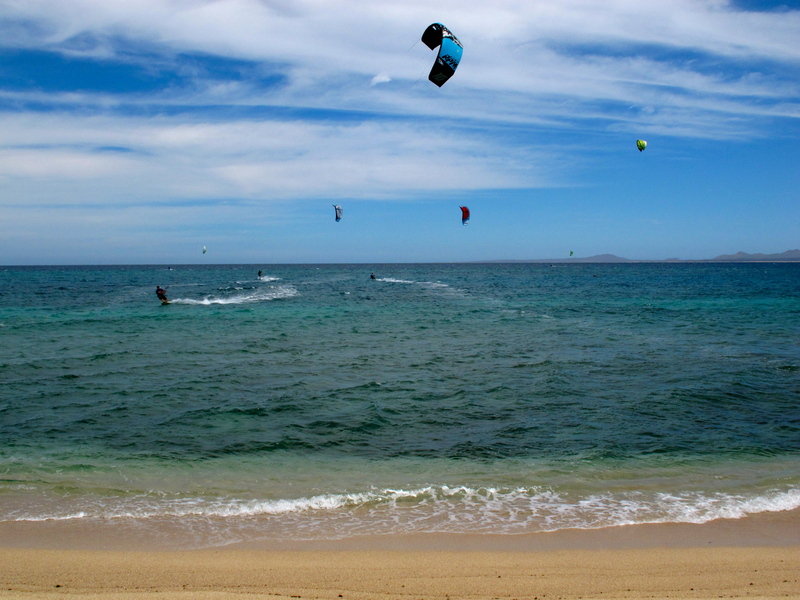 La Ventana is a little town set along beautiful beaches with brilliant aqua waters. It was incredibly breezy the day we were there and given the number of windsport shops, this is likely the norm which isn’t a bad thing considering the heat! 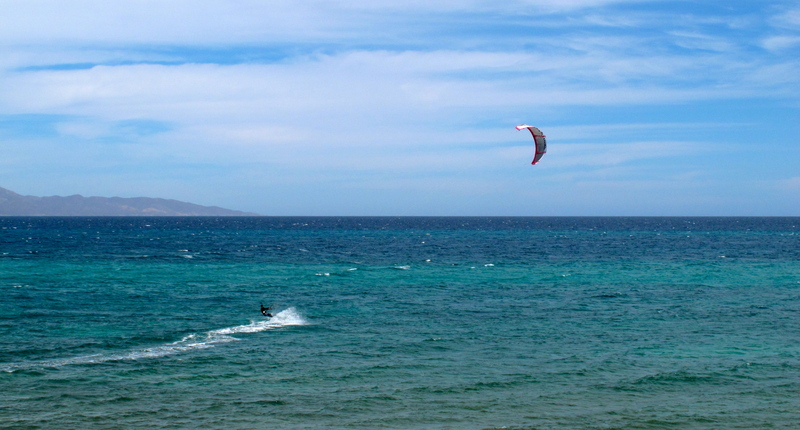 We had a very tasty lunch at Las Palmas Fish & Bar in El Sargento and spent a few hours enjoying the views and watching the kite boarders. There were lots of people of all skill levels on the water. We watched these guys doing tricks and jumps. We ended the day at Campestre Marinatha in La Paz. We stayed there when we came through the first time and found them to be very friendly with everything that we liked to have. It was nice to be back in familiar surroundings even if it was just for a night. 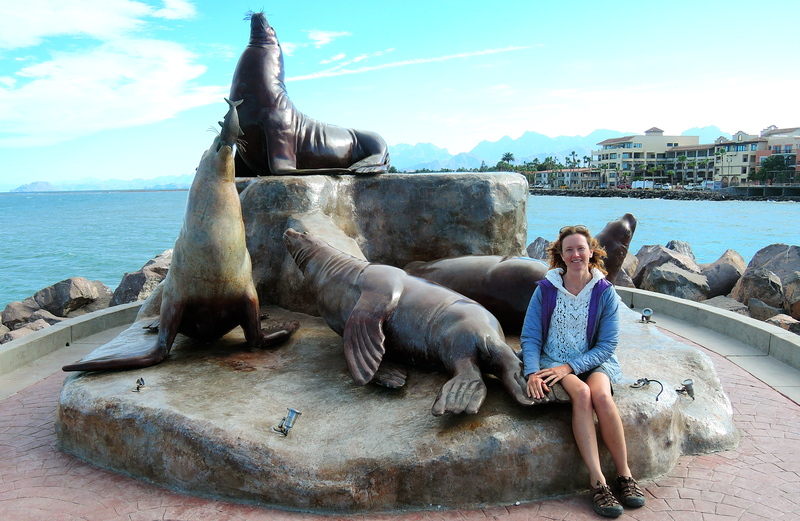 When we arrived, we ran into a couple that we saw in Mulege and we ran into them later in Loreto. It seems that all travelers follow in each other’s footsteps throughout Baja, eventually crossing and re-crossing paths along their journeys. It’s one of the things that Darryl and I are really enjoying as we continue along our travels. Baja MexicoBaja Sur MexicoCabo San LucasLa Ventana B.C.S.San Jose del CaboTodos SantosTodos Santos B.C.S. We rolled into the Buena Ventura Resort & Restaurant on the Bay of Conception in early evening. We were looking forward to a warm meal and better still, a warm shower. 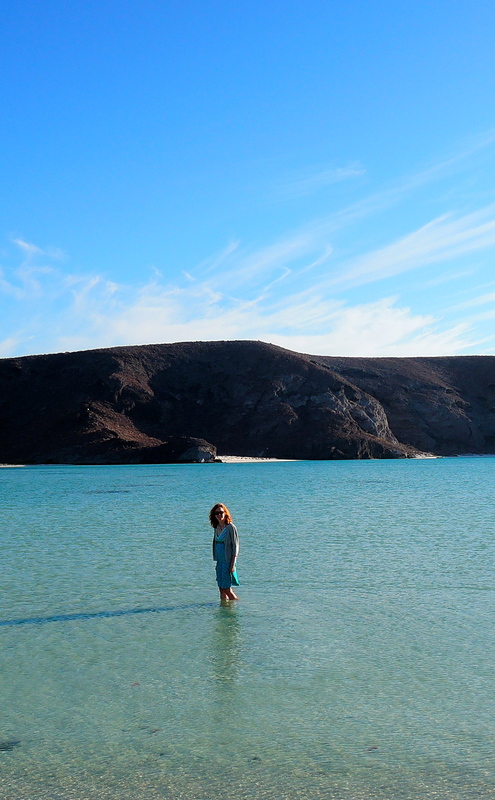 The Bay of Conception is on the Sea of Cortez side of Baja. This meant that the temperatures would be a little warmer and hopefully there would be some relief from the winds. The bay is huge and we had a stunning beach front view of it. We had some chips and salsa at the Restaurant since we arrived too late to put in our request for the fish dinner. There were about 7 customers there that evening. We chatted with Jentra about her adventures earlier that day. She was out on Coyote Bay, which is an inlet just north of where we were, with her husband and another friend. Their friend Kenny took them out on his boat to try and find the whale sharks that were hanging out there. He spotted the whale shark quickly and they saw that it was tagged. They were able to contact the marine biologist who tagged the whale shark in Australia! Darryl and I have a few items on our bucket list for this trip and seeing a whale shark is one of them. So the next morning we rented kayaks out of Coyote Bay at Playa Enseñada el Burro. When we embarked on our journey, the water was very calm with very few waves. 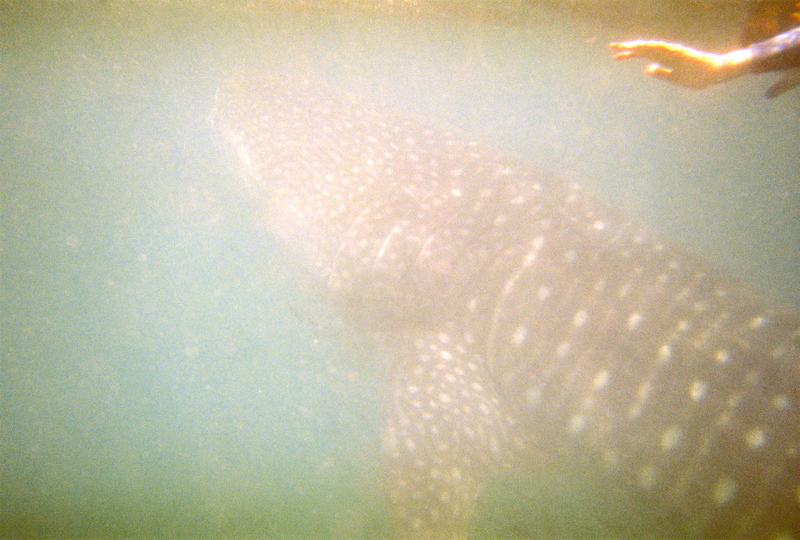 We stayed near the coast since we heard that whale sharks like to stay in shallow waters. We have never seen them except for in photos but Jentra said that we would be able to see their dorsal fin sticking out of the water. Once out on the water, I quickly realized that if I am to become proficient at all in kayaking then I will need to invest in some lessons. It was just a little windy out on the water and I was tossed around by the wind and the currents with no real control over my direction for more than a couple of minutes. Darryl was far ahead of me. I am sure that I was scaring off any whale shark within a mile of us with all of the noise I was making with the paddles. With every paddle stroke I hit the side of the boat All of this aside, I was thoroughly enjoying myself and the view was worth all of the challenges. Happily searching for whale sharks but no luck on this day. Pretty soon we noted that that the winds were picking up and the waves were getting choppier so we decided to head back. I wasn’t having so much fun at this point since our way back meant heading into the wind. I had the paddles in a death clench and with all of the tension in my hands and my arms, I was getting tired pretty quickly. Fortunately, we didn’t have far to go and we were always close to shore. I managed to relax a little to take a photo of Darryl as he cruised along ahead of me. Uh oh, time to head in. The wind kicked up and created a little challenge for us on our return. 180º view of Playa Enseñada. Another view of Conception Bay. It was dotted with islands making it very picturesque. You can see that we weren’t in any danger. It was just my first time paddling in anything resembling choppy water. 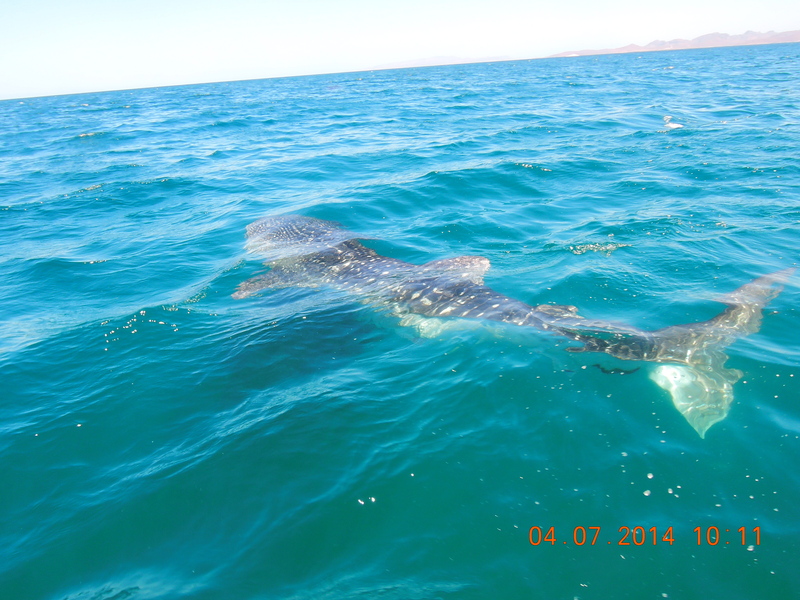 We didn’t see any whale sharks on this day but we knew that we would have a very good chance of seeing them in La Paz. We were headed there in the next few days but first, we would be stopping in Loreto which is one of the Pueblas Magicas (Magical Towns). These are towns that are being promoted by the Mexican Tourism Agency as places to visit which have a uniquely Mexican flavor to them. We arrived in Loreto by early afternoon and had a wonderful lunch at Mexico Lindo y Que Rico. I had the Enchiladas Susana which were delicious!! After lunch we found our next campsite, Rivera Del Mar in Loreto. It’s a small RV resort with a charming feel to it and within walking distance of the town center. They have clean bathrooms with showers for about 240 pesos per night. After setting up our tent, we said a quick hello to our Canadian neighbor. We saw a familiar rig in the lot and were pleased to see that John and Jimmy, who we met a week earlier in Mulege, were staying there also. What a small world! Their ATV’s weren’t there so we assumed they were out exploring the town somewhere. We walked to the town center which has a small pedestrian only section where there are tourist shops and the Loreto Mission. Unfortunately the mission was closed so we only have some photos of the outside. View of the Loreto mission’s bell tower. Sea shells chime at one of the vendor stalls. It was getting late so we started back to our campsite. We were talking about what we had prepared for dinner and I realized that we only had rice and beans left. There was plenty for a meal but we had been eating it along with a chicken dish I made for the past three nights. Darryl was a good sport about it and we agreed that we’d finish it off rather than eating out. Once we arrived at camp we stopped to talk with Linda and Al, our Canadian neighbors, for awhile. John and Jimmy had returned from their adventures so we were able to catch up with them also. John was busy at the BBQ and when we walked by him to say hello he told us we just HAD to try this yellow fin that they caught earlier that day. They caught four yellow fin, two of them weighed about 30 pounds and the other two were about 25 pounds. He had a full cooler of them and another 40 pounds that were getting packed on ice to be shipped back to California. Earlier that day John got a great deal on a few pounds of lobster tails so he was grilling them up also. Darryl and I had a bite of the tuna and John kept putting more tuna on the grill and offering more to us. We went from a potential meal of rice and beans to a meal of yellow fin and lobster tail! What a turn of fortune!! And on top of this, we were able to hear about Jim and John’s latest adventures. It turned into a really nice evening. John grilling up the most perfect dinner! Thank you again!!! 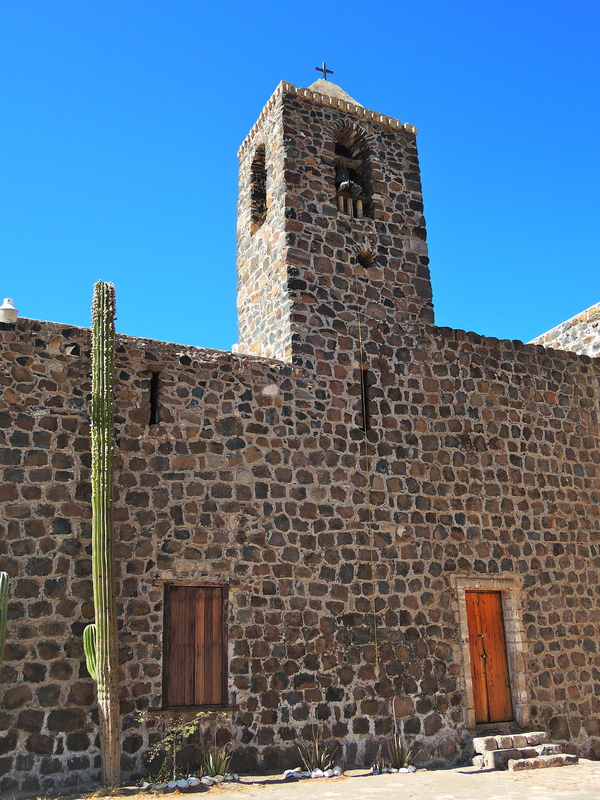 We did a day trip out to San Javier Mission just outside of Loreto. The drive out to the mission is through beautiful country on a paved road that was being repaired after a storm washed out half the road last year. Apparently 36″ of rain dumped on the area last fall. I can’t imagine what that would be like! We stopped to photograph this small chapel along the way. 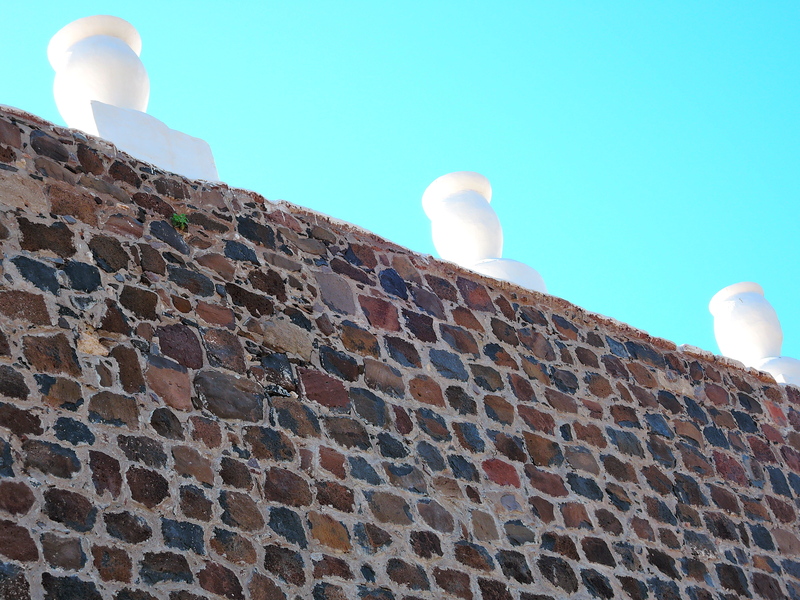 It was built as a respite for pilgrims traveling to San Javier Mission during the Feast of San Javier. The Mission was one of our favorites with a mountain backdrop and a small field of corn and grass fields with horses and a few cattle. Click on the image below to enlarge them. View of mission bell tower. View of cemetery on Mission grounds. At the Mission, we saw this awesome bike set-up. The couple riding this has been traveling the world on their motorcycle for the past four years. This beefed up bike has taken its riders through all weather and climates. 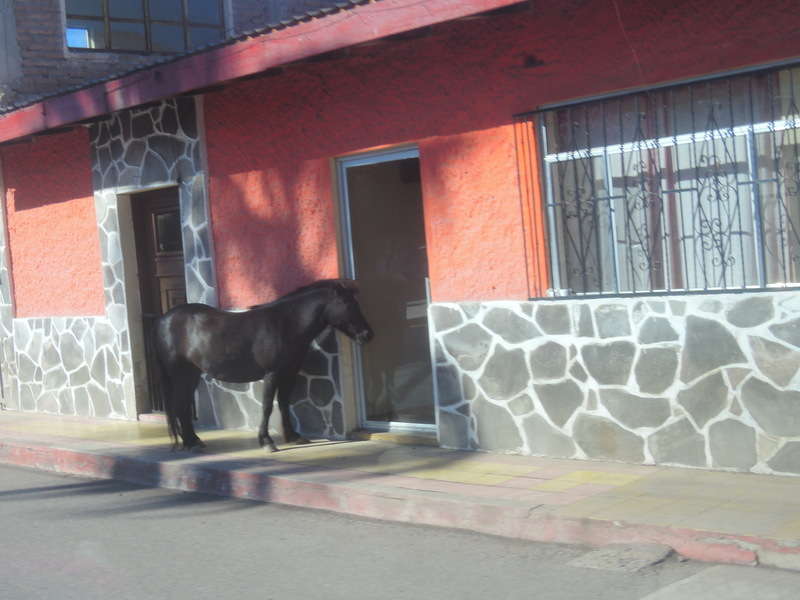 We saw horses and burros throughout Baja. This horse was gorgeous! He was galloping along the road as we drove by and I had to take his photo. In addition to the road work, Darryl had to avoid the animals along the road. This is why they say you shouldn’t drive at night given all of the obstacles. There are also ‘topes’, a.k.a. speed bumps, that are sometimes very big and in many unexpected places. Why did the burro family cross the road? We enjoyed strolling along the malecon on our last day. I loved watching the bird and we enjoyed the beauty of the sea. Loreto is a lovely town and we met some very special people while we were there. I hope that the town doesn’t lose its appeal but I fear that the Mexican tourist agency has plans to make Loreto into another tourist destination similar to Cabo San Lucas. They are building some resort areas just outside of town with golf courses and marinas. If they turn it into another Cabo it would be a real shame. At least we were able to enjoy it while it is still charming. Here are some of the photos we took along our walk. 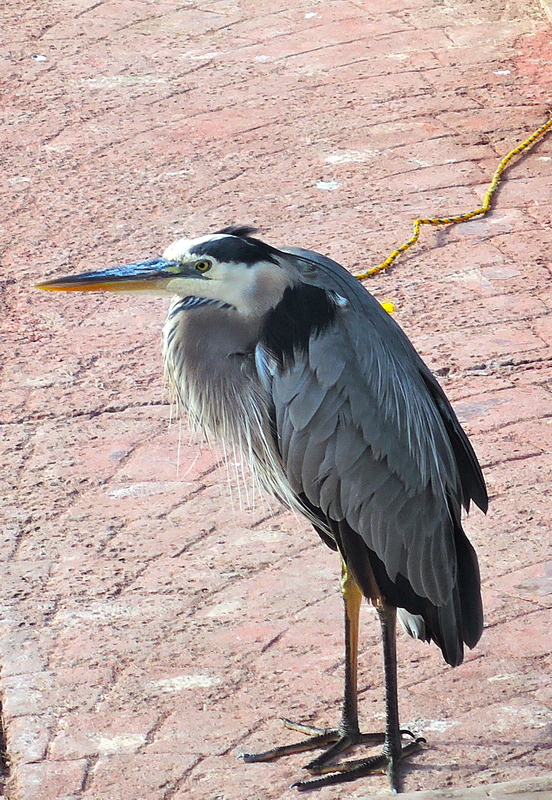 These great blue herons look like old men to me with their hunched back and serious look about them. Before we left Loreto, we made one last attempt to eat at Ray’s tacos. Our Canadian neighbors, Ed & Linda, recommended the place as the best tacos in town. We were there for three days yet it was never open. We stopped through Loreto on our way back north on our return to the US and it wasn’t open then either! These uncommon business hours were a common theme throughout Baja. We were looking forward to our next stop, La Paz, because we heard that it was a popular migrating stop for whale sharks. During our time in La Paz, we camped at Campestre Marinatha which is a Christian Ministries camp just on the outskirts of town. It is a large campsite with clean bathrooms and showers for 200 pesos / night. We spent our first day in La Paz doing laundry and then a little exploring around the area. There was a spit of sand that we were able to drive along where the beaches went on forever with nobody in sight. At one part along the spit it was so narrow that we could see the water on both sides. It was stunning, except for the little pockets of trash left on the beach by other campers. It’s so sad to see these beautiful spots tarnished with the trash left behind by people that don’t seem to really appreciate the beauty around them. We had the beach all to ourselves this day. There are some free campsites out at Playa Tecolote and Playa Balandra so we headed out there to see what they were like. Playa Tecolote was packed with families enjoying the day together. This is one thing that Darryl and I have noticed about the Mexican families. They really seem to enjoy their time together while out on the beaches. They will be out with their children, their parents and their grandparents, with lots of laughing, dancing and enjoying themselves. We had lunch at the beach and enjoyed the views. The food was ok but the view was spectacular. Looking from our table onto Playa Tecolote. We went further along the coast and stopped at Playa Balandra. This was a very shallow inlet and a few palapas along the beach. It was much quieter than Playa Tecolote. I went for a walk out into the waters. I think that I could have walked all the way to the other side! Enjoying the waters at Playa Balandra. The next day we went exploring again and found these wonderful beaches just beyond Playa Tecolote. There were signs all along the roads saying that we were on Private Property and we could see that they are being parceled for development. We’re thankful that we were able to enjoy them before the big build-outs. It will be a completely different place once this land is sold and developed for private housing. We spent a couple of hours just enjoying the solitude and the sounds of the waves breaking on the beach. We went back into town and reserved a tour for the next day to see the whale sharks. We were told that they have had 100% success in finding whale sharks this season! We stopped at the Archeological Museum and found that although it was still under construction it was open to the public. All of the descriptions were in Spanish, when there were descriptions. The woman who admitted us was kind enough to take us through the exhibit, essentially giving us a private tour, all in Spanish. Although we didn’t understand 100% of what we were told, the photographs of the petroglyphs were impressive and they had interesting exhibits depicting the lives of the early Indians of the area. There were actual artifacts included in the exhibits. One of the exhibits showed the ceremonial burials with the bones still wrapped in their original leather bindings. The next day we were ready for our big event, snorkeling with the whale sharks! There were four others on the tour with us and we were split into two groups of three. Once the captain of the boat spotted the whale shark he would stop the boat and we would get prepared to jump into the water. 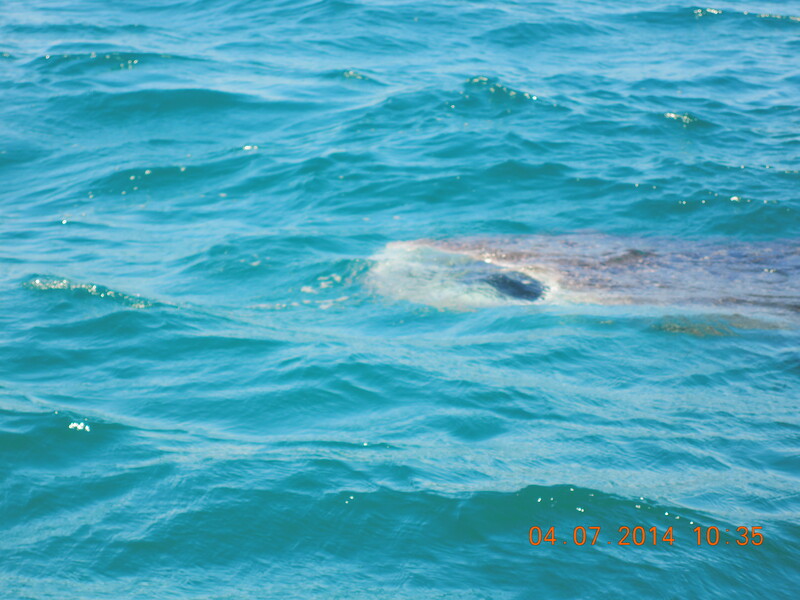 Once in the water, we could no longer see the whale shark which was perhaps 10-20 yards away. Their coloring is a dark grey with small spots, allowing it to blend perfectly in the waters. We would have to look back at the others on the boat who would point us in the direction that we should swim. The whale sharks would just kind of hang out in the waters, slowly swimming along, which allowed us time to swim toward them. It was incredible to see this huge fish appear suddenly in front of you! The first one that I encountered was a juvenile whale shark, only about 20 feet long with a head (and mouth) that was about 8 feet wide. They grow to be about twice this size! They are gentle creatures, neither whales nor sharks but rather very large fish. Once they got tired of us hanging out with them they would just flick their tail and vanish with surprising speed. 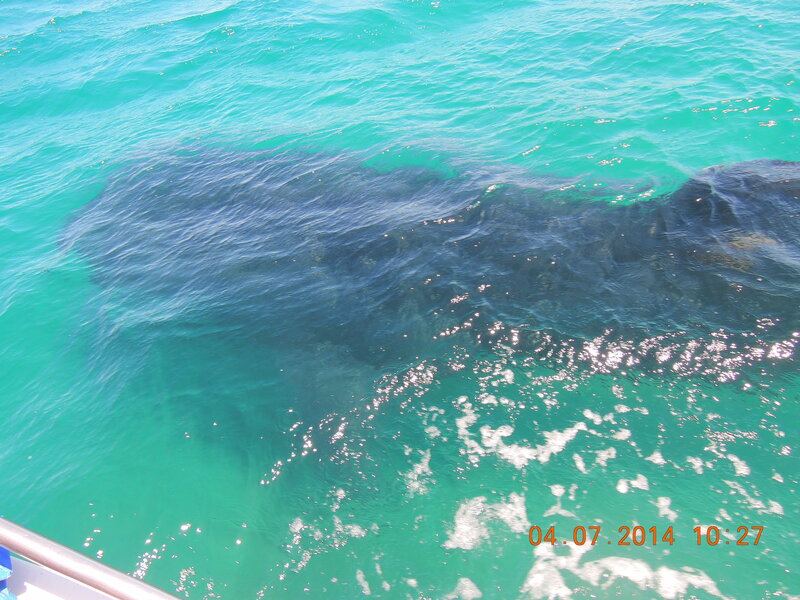 Darryl and I got to swim with four whale sharks and we saw many more from the boat. It was a perfect day and an unforgettable experience. My hand as I’m trying to swim with this giant. Trying to show some perspective with the side of the boat included here. This is another juvenile. We didn’t see any of the fully grown adults. This whale shark is feeding on plankton. Our time in La Paz was coming to a close. 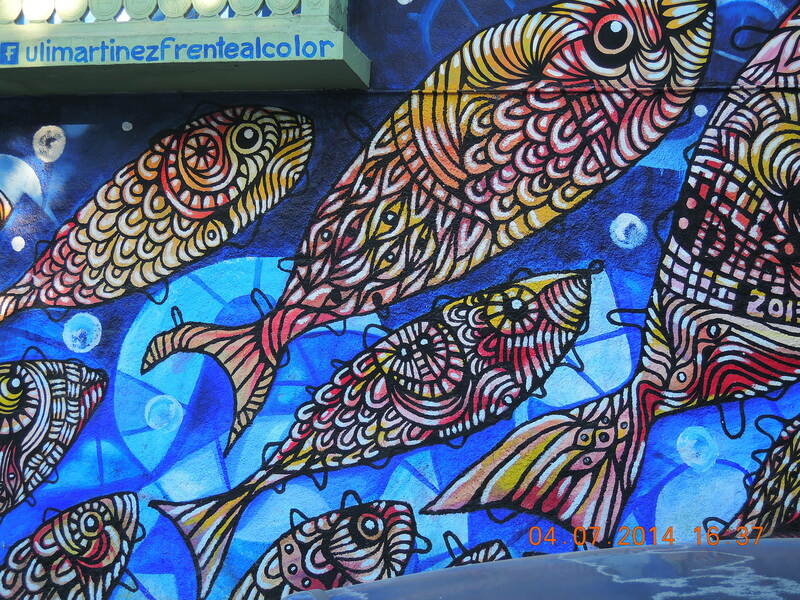 While strolling through the back streets we came across a beautiful mural. After our time earlier with whale sharks, it felt like a perfect tribute to our day. The message to the casual observer was to stop destroying our waters with pollution and poisons. We stopped for our final dinner and enjoyed the beautiful weather while people watching at El Rancho Viejo. A nice ending to our whale shark quest. 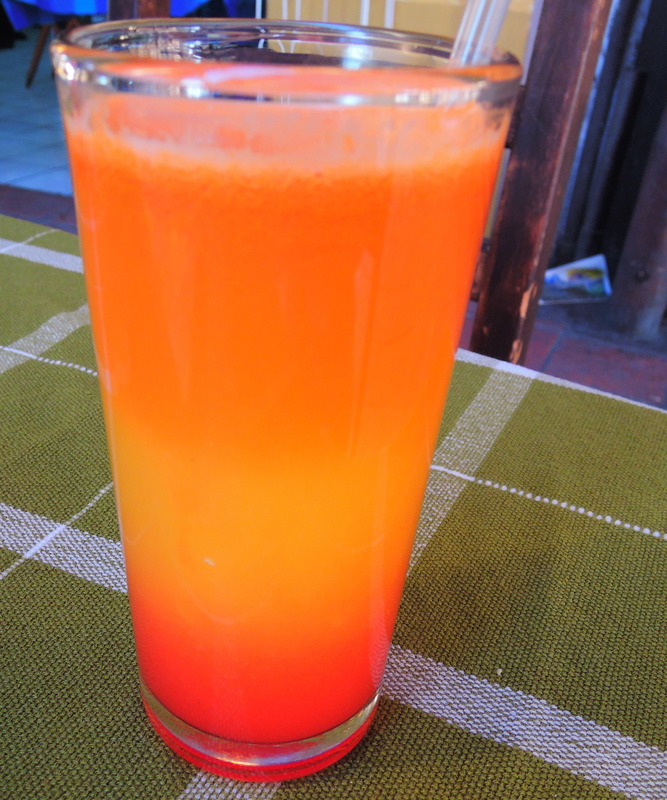 Fresh orange / carrot juice that tastes as good as it looks! 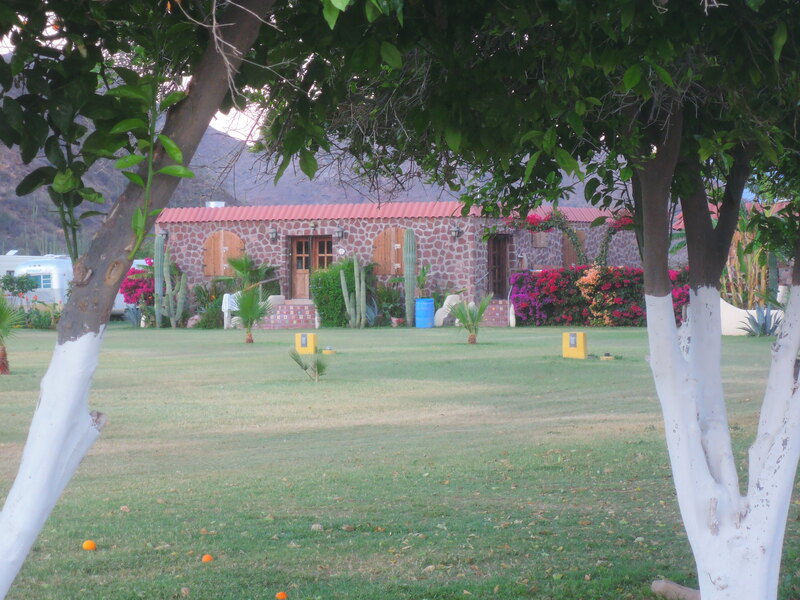 We arrived late in the evening at Hacienda de la Habana, our campsite in Mulege. Our new home for the night. This place is near the edge of town with a seemingly complicated set of directions down unnamed dirt roads but it’s well worth the extra effort plus, there are signs at every corner for the camp’s restaurant, Ray’s Place. We stayed here for three nights but the restaurant was never open during that period. 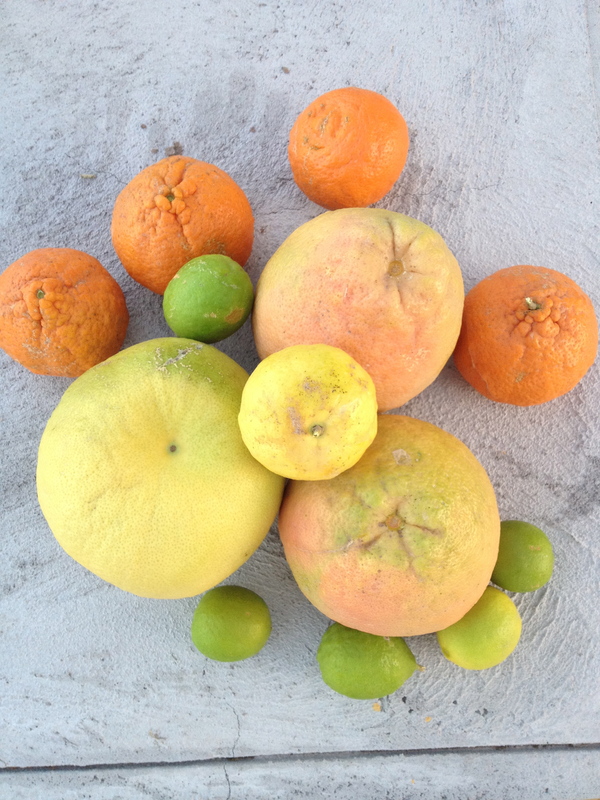 We did have some fresh fruit picked for us by the grounds keeper. The business hours were a little hit or miss at many of the restaurants and other small stores all throughout Baja. It was very common for places to be closed for most of the week with nothing indicating when they might be open. We really loved the style of this home on the campground. 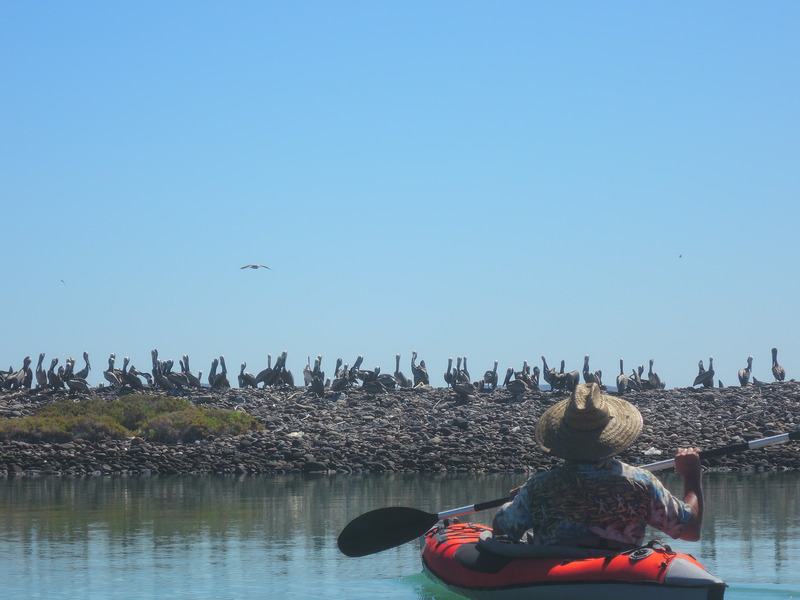 The next day, we arranged for a tour guide to take us to the “arte rupestre” which are the petroglyphs that are found at various sites throughout the Baja peninsula. 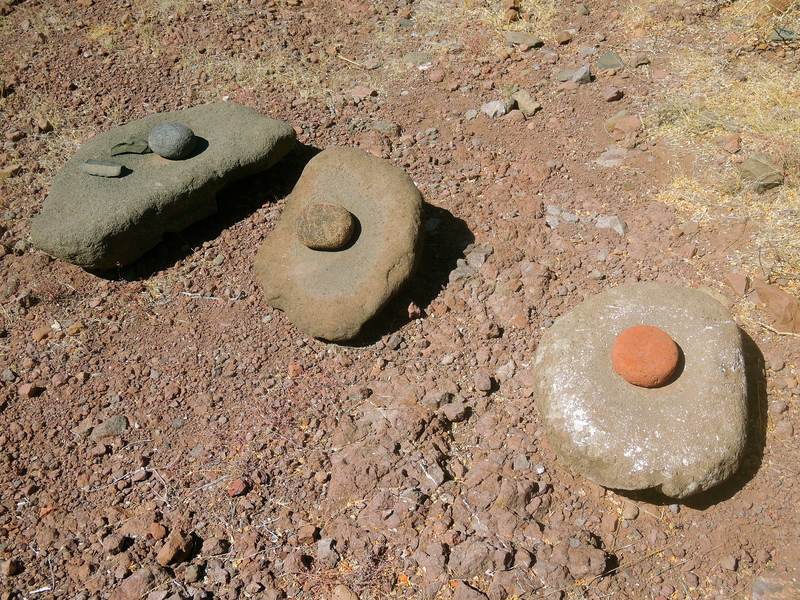 A certified guide must accompany tourists at the La Trinidad petroglyphs. Ours would be Salvador Castro Drew of Mulege Tours. This pony seems to know where he belongs. The rest of the day was spent enjoying the scenes of the small town of Mulege and hanging out in the local café with “almost free wifi” which meant that we just needed to purchase something to use their internet. I finally posted my first blog on this day! We met our guide Salvador the following day for a full day of easy trekking through the mountains along with a family of three from Florida. 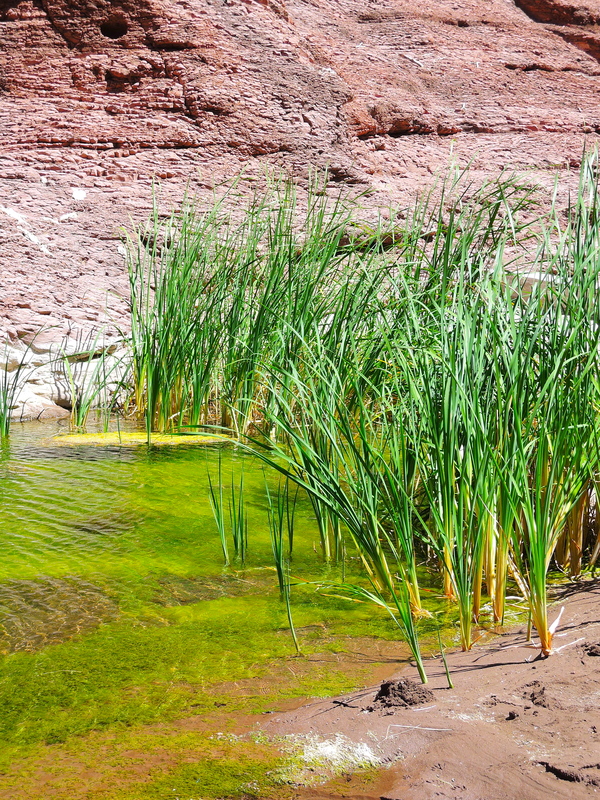 This is one of the handful of springs that were along the trail. 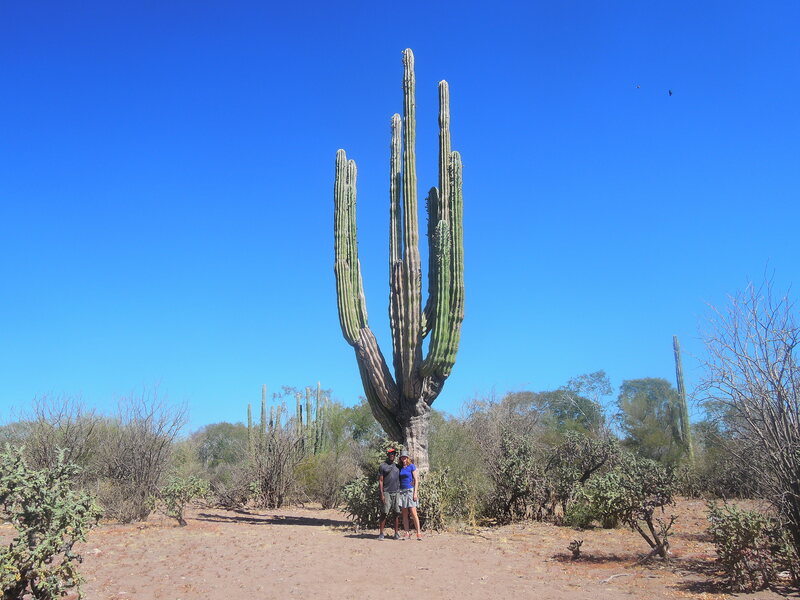 Our tour included a stop along the road where we could get our photo taken next to a giant cactus. Salvador told us about the medicinal and other practical uses for the various plants of the region. At the beginning of the tour he said that with the knowledge that he was about to share with us we would be able to survive out in the Baja desert. 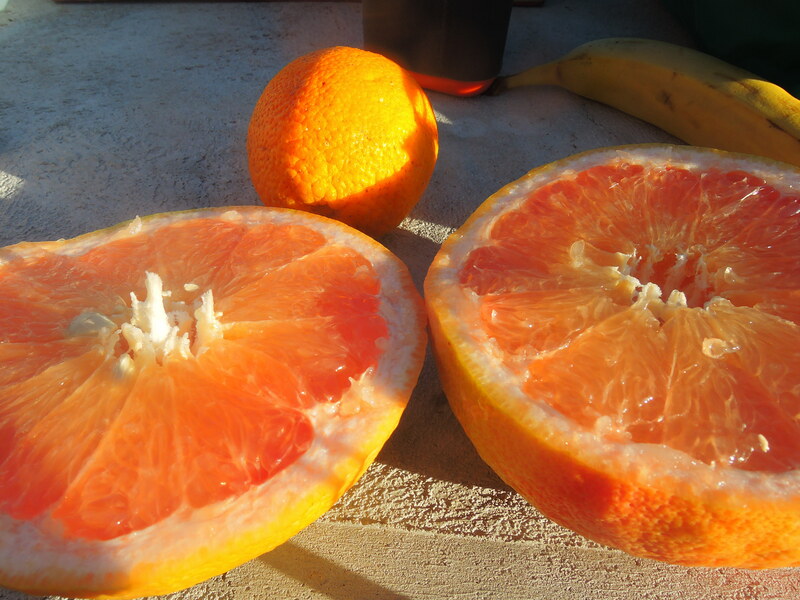 There were plants that could cure ailments of the stomach, liver, or colon; cure headaches and potentially cure cancer. He showed us anti-coagulants to stem any bleeding. We learned about mushrooms used as food and another used by the priests for their visions. After our survival training, I can confidently find water in a barrel cactus and then use the leaves of the creosote bush to eliminate my foot odor. All of the other pearls of wisdom were forgotten by the time we returned to the van to continue the tour. Here we are next to the giant cactus. Salvador had a wealth of knowledge about the local petroglyphs and the history of our very limited knowledge of this arte rupestre. 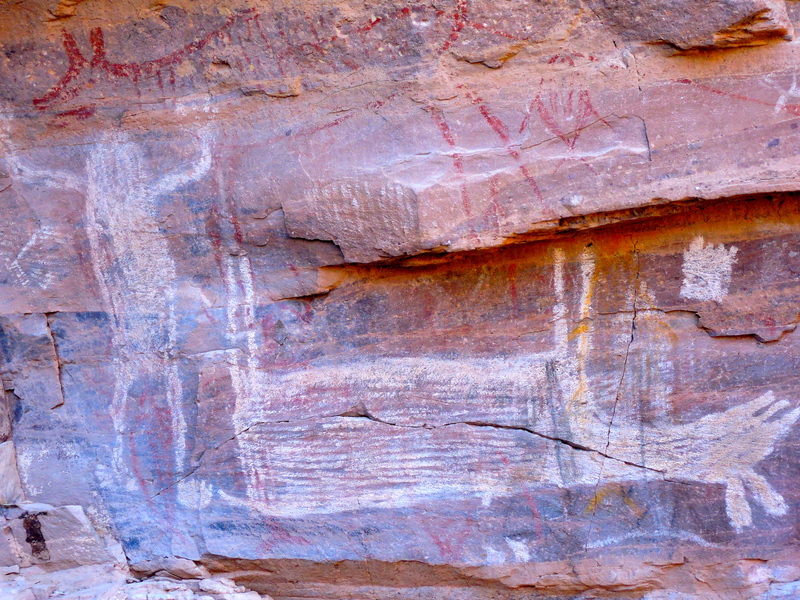 The petroglyphs in the area have been dated to between 2,000 and 7,500 years old but this is still debated. Ancestors of the now extinct Cochimí Indians or Guaycura Indians were the likely artists of the La Trinidad area. 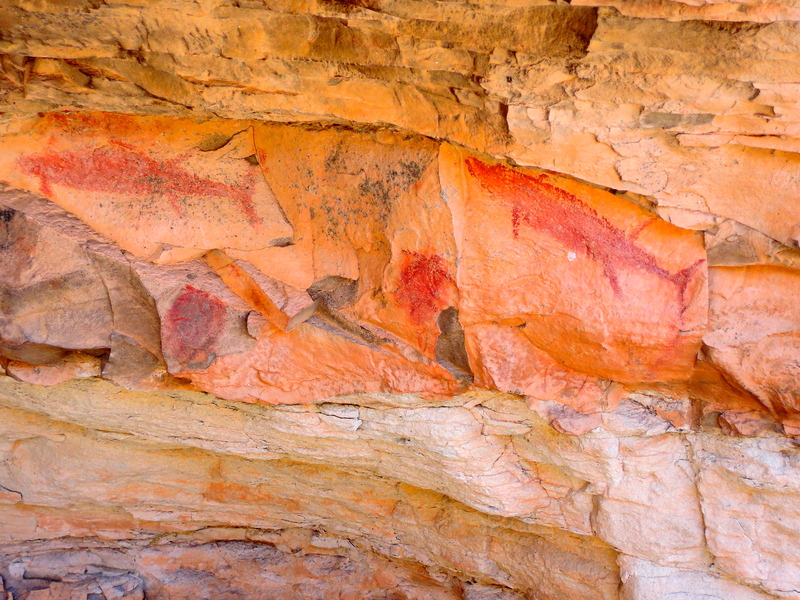 Nobody really knows the meaning of this ancient artwork but there are many guesses. Salvador told us how the last links to our understanding of these ancient people were lost after two events; the extinction of the native Cochimí Indians and the exile of the Jesuits from the Baja Peninsula by King Carlos III of Spain. According to Salvador, the Jesuit missionaries gained the confidence of the Cochimí Indians. 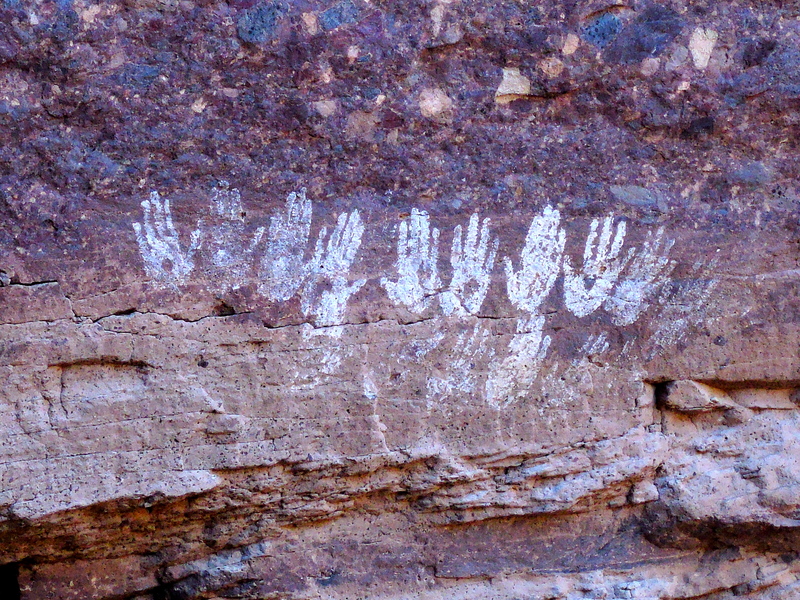 The Indians began to share with the Missionaries their knowledge of the area and about its history including what they knew of the petroglyphs. Some believe that the Cochimí ancestors may have been the artists some hundreds of years earlier but the meaning and purpose of the petroglyphs was lost through the generations. The Jesuits were meticulous in their documentation of the land, the people, the geography etc. They documented what was told to them by the Indians but upon learning of their impending exile from the peninsula by the Spanish crown the missionaries destroyed their writings rather than leave them for the benefit of the Spanish. 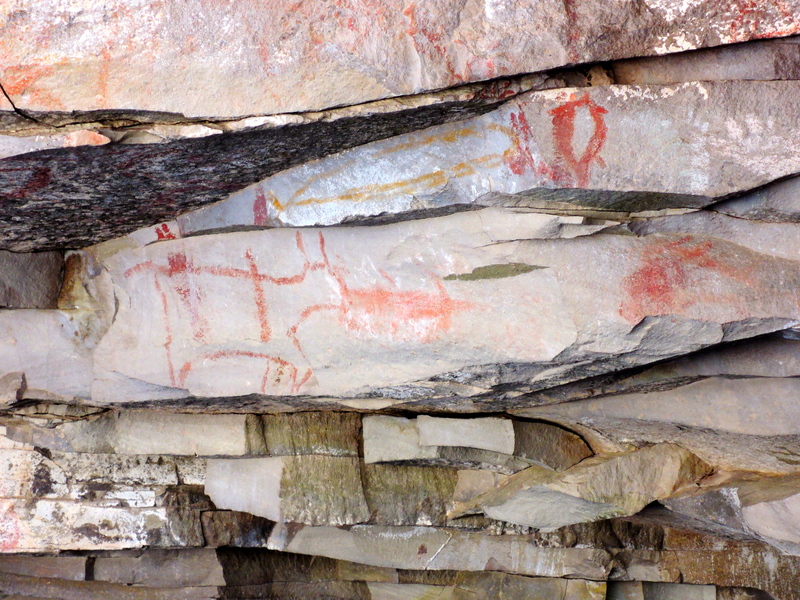 Only a few documents remain from the Jesuits describing some of the petroglyphs in the southern part of the peninsula. The figures that we saw were of the animals that were hunted (deer, turtles, fish), figures of humans, perhaps their shaman, and hunting figures, hands, and other unknown figures. These were likely children’s handprints. Reminds me of some artwork that I did in kindergarten! 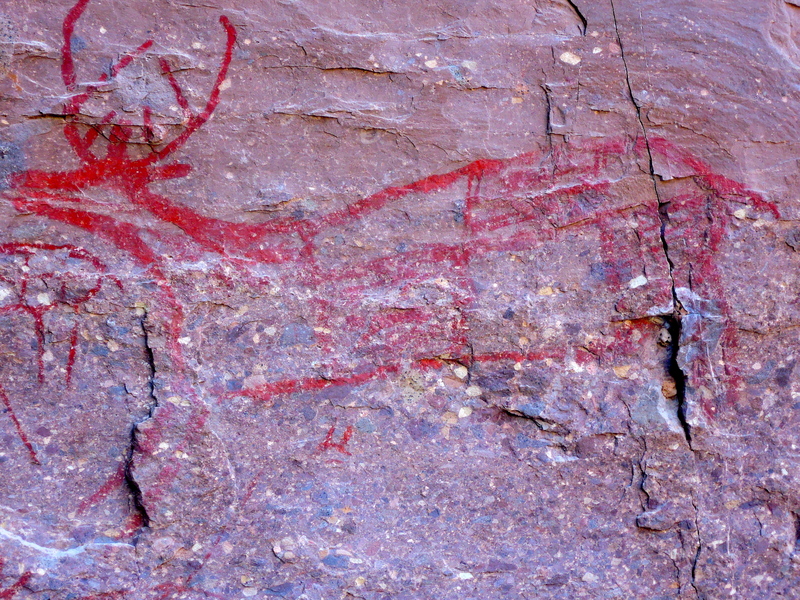 There were many drawings of deer, some of them had spears sticking out of them. This looks like the result of a successful hunt. Some fish and turtle figures. Animals with lines through them were common. Throughout the La Trinidad area, archeologists uncovered artifacts of early life among these ancient people. 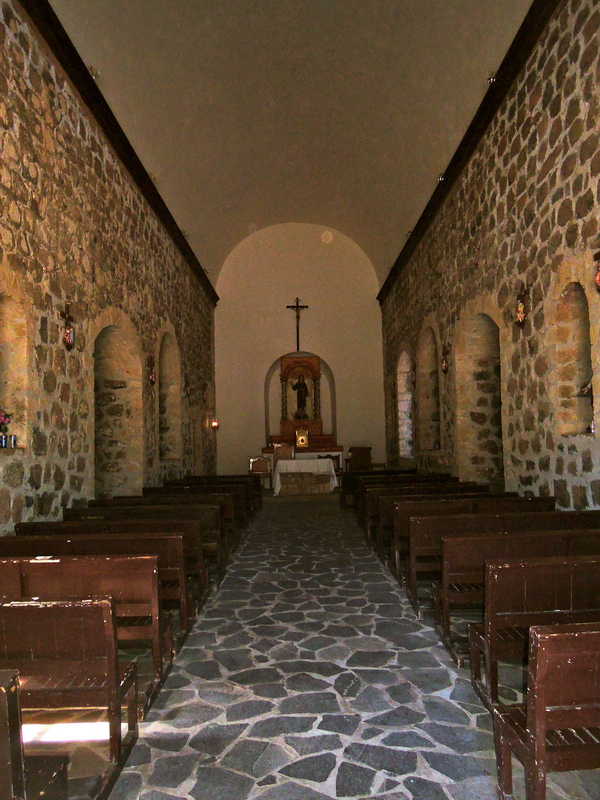 Our tour ended at the Mission Santa Rosalía in Mulegé. This mission was founded in 1705 by the Jesuits and taken over by the Franciscans in 1768 after the expulsion of the Jesuits from Baja. It ceased to function as a mission by 1828. Today, there is a priest that will come to the mission and conduct mass at times and there are weddings that will take place here. 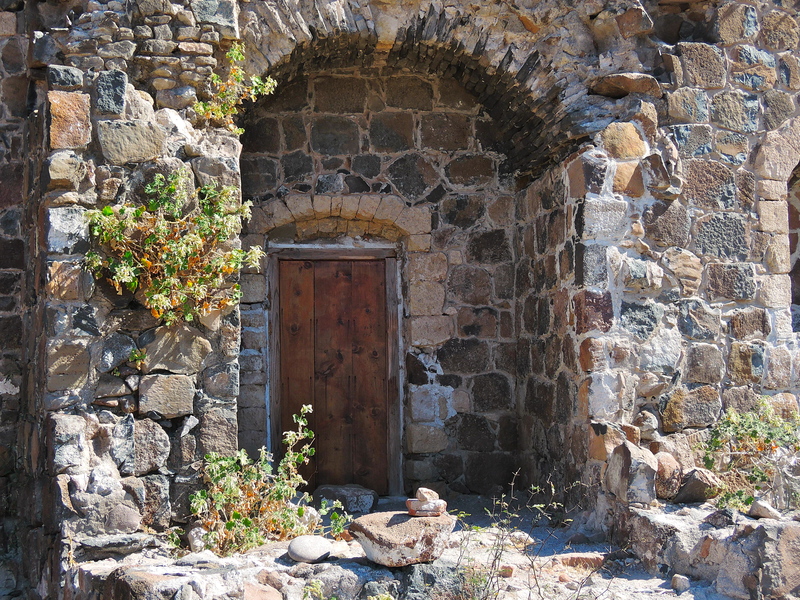 This mission has been completely restored but retains some of the original stones. View of the outside walls. The mission was very small but charming inside. 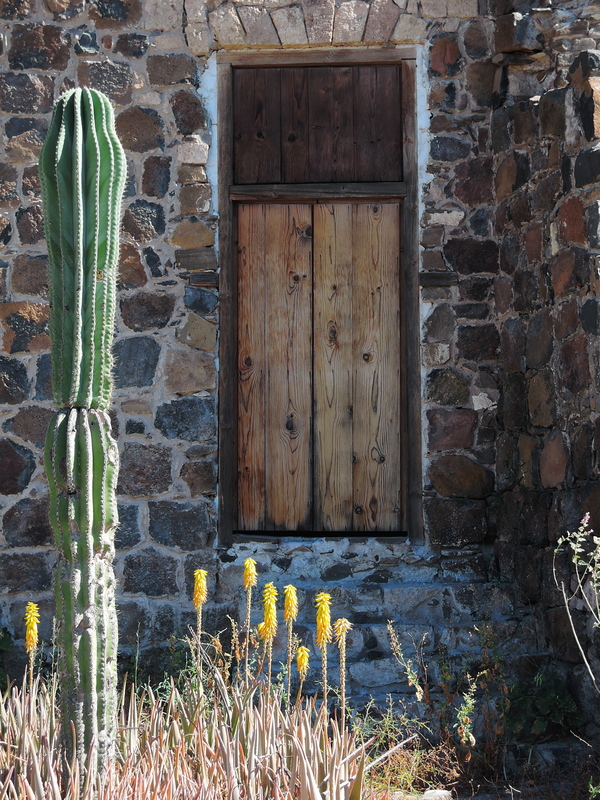 I loved the varied doors around the mission. 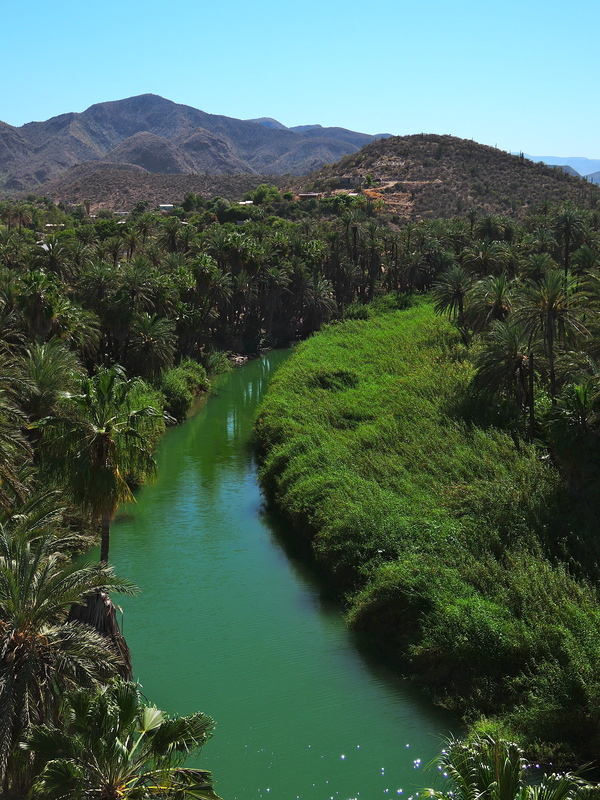 We ended our tour overlooking the beautiful little river that runs through town surrounded by date palms. You’ll understand why I say this in a moment. I was preparing our supper at our next campsite along Bahia Concepción when our new neighbors stopped by to take a look at our Cascadia roof top tent. This tent is awesome, as a means for shelter, but even more awesome as an icebreaker. Every day, somebody comes by to check it out and we meet some pretty special people because of it. On this particular night we met Jen, Greg and his brother Arnold. They are from Half Moon Bay, just south of San Francisco along the coast. It is also where Darryl and I had our first date and where we were married 16 years later. So the town holds a pretty special place for us. We chatted with them about the tent and then generally about life in the bay area. Greg and Jen are both retired from the hectic work life of 8 am – 9 pm that doesn’t seem to stop even then since, with the magic of technology, we are available for meetings with our international counterparts all over the globe at all hours of the day and night. This is the life that Darryl and I are leaving behind and we’re hoping to find a new home with a slower pace, a great outdoor playground and a friendly vibe. As we’re chatting, Greg generously offers up his kayaks for us to take onto the bay the next day since they won’t be using them. We were amazed that these people that we just met would be so trusting of us! Imagine that happening in the Bay Area. I doubt that it would. But in this topsy-turvy world of camping that Darryl and I just entered, this is how people treat each other! So Darryl and I have only kayaked a couple of times so we were a little hesitant about using someone’s kayak that we just met. We thanked them but told them that we didn’t have enough experience. They told us that if we changed our minds, the kayaks would be there for us. They left us to our dinner and invited us to stop by later to hang out some more. We spent a couple of hours chatting with them while watching the little fishes jump along the shore. 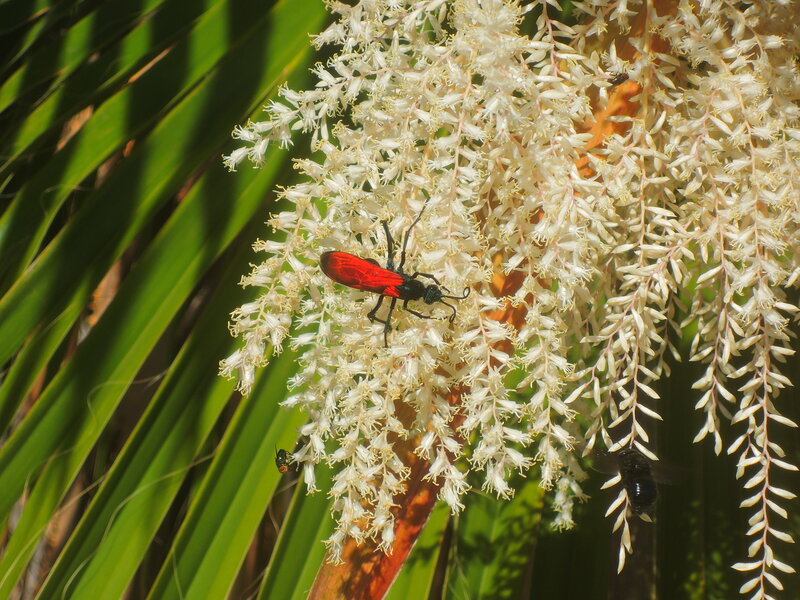 The next morning, Arnold came by after breakfast to show me some beautiful wasps hanging out on the date palm blossoms. He offered to take us out on the kayaks. Given the beautiful day with no winds, a glassy bay and our enthusiastic guide, how could we refuse!? I put on my sunscreen, and we grabbed our cameras and headed out onto the bay with Arnold. First we got comfortable and learned how to paddle in unison. We did pretty well and were able navigate the kayak without much trouble. 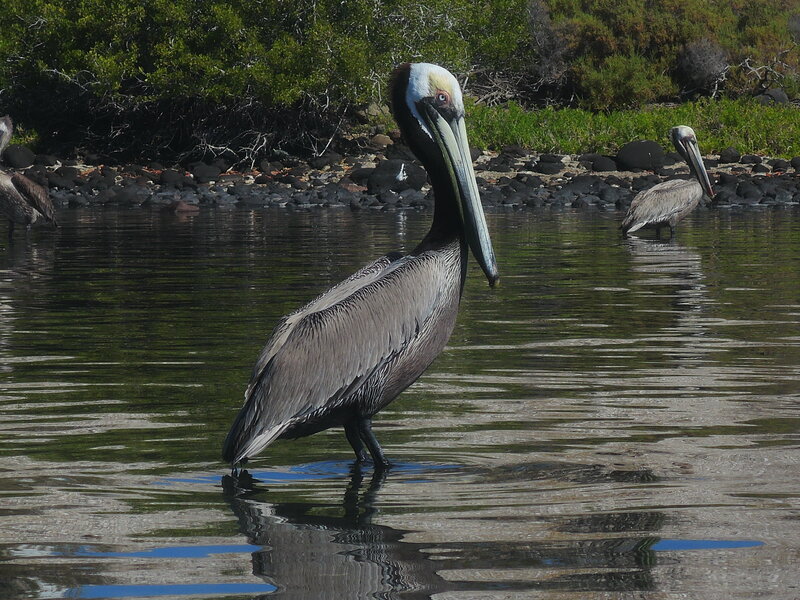 We spotted some pelicans sunning themselves along the rocks. They were so calm, letting us approach to within a few feet of them. We were pretty comfortable on the water so we ventured further out to the mangroves along a jetty across the narrow inlet. Arnold told us that oysters grew along here. 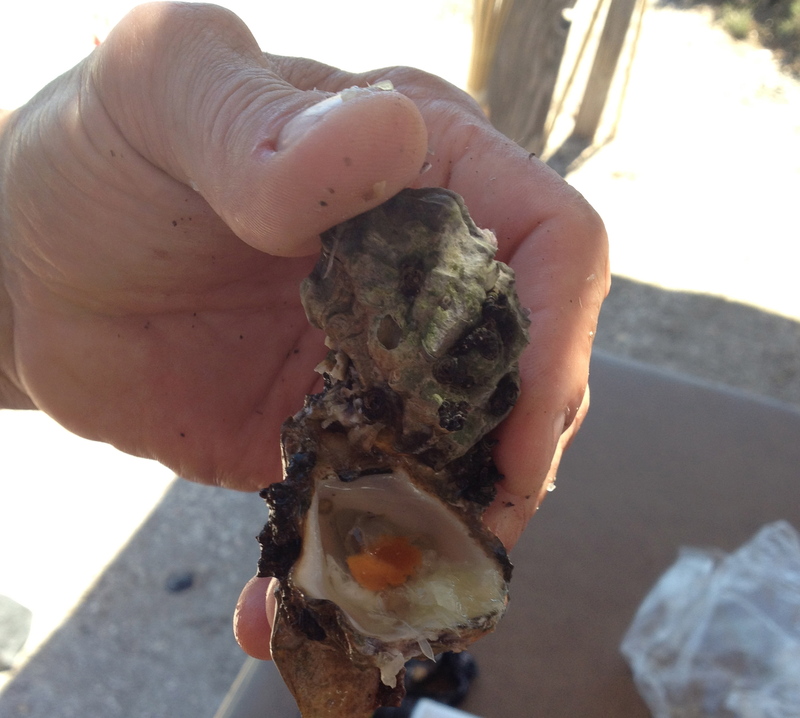 I jumped out of the kayak into the shallow water to harvest a few oysters growing along the mangrove roots being careful to shuffle my feet, like Arnold said, to spook any stingrays that might be resting on the bay floor. The night before, Greg and Jen both shared stories with us about their encounters with stingrays and how painful the sting can be. I definitely didn’t want to add that to my list of experiences on this trip! By the way, if you do happen to get stung by a stingray, pour hot water over the sting; as hot as you can possibly tolerate. This will neutralize the pain. We pulled the kayaks up onto the narrow jetty and enjoyed the view. There were rows and rows of pelicans enjoying it as well. Arnold and his troop of pelicans. A quick photo op with Arnold and me. We noticed hundreds of birds and pelicans diving into the waters just off the other side and Arnold thought it would be great to get into the midst of the action. A couple of fishermen tried their luck at the spot but came up with nothing and moved on. We carried our kayaks to the other side and headed over to the feast. While we were in the midst of the pelicans, a commercial fishing boat showed up. We were intrigued by what they were doing and I caught some of it on my camera. At the time, we were clueless about the details of what we were witnessing. We later learned that the larger boat was a table seiner and what we were witnessing was seine fishing. What is amazing about all of this, an underscores the title of this post, is that we learned about seine fishing from a Canadian who was a retired commercial fisherman. We met him about 2 weeks after our kayaking experience. What are the odds of that happening!? Darryl started to explain to him what we saw and I went and pulled out my computer to show him the video. He was so excited to explain to us how the table seiner worked and then went to get his computer to show us some more examples of seiners. Oh, and the reason we started chatting with him was because he came over to check our our tent. Like I said before, it’s our perfect icebreaker!! So here are a few of the details about what I have in these videos. When the table seiner first approached its fishing spot, it laid the net out in a circle. The net was piled on top of the flat section (or table) of the seiner and as the seiner made its way along the circle, the net would drop into the water. They close the loop and then begin this pounding racket that we could hear over the loudspeaker. This noise scares the fish into the nets and all throughout this process you see these sea birds feasting on the fish being drawn into the nets. There was a second, smaller boat, attached to the seiner by a long rope. This is called a power skiff which pulls against the seiner, preventing it from tipping over as it hauls in its catch, also called brailing. They were using a purse seine to draw up the net. You can see this in the next video where you see nets hanging from hooks from the boat. A hook is dipped into the water that draws up part of the net which creates a sort of purse, trapping the fish inside of it. This continues until all of the net is drawn up out of the water with the catch. 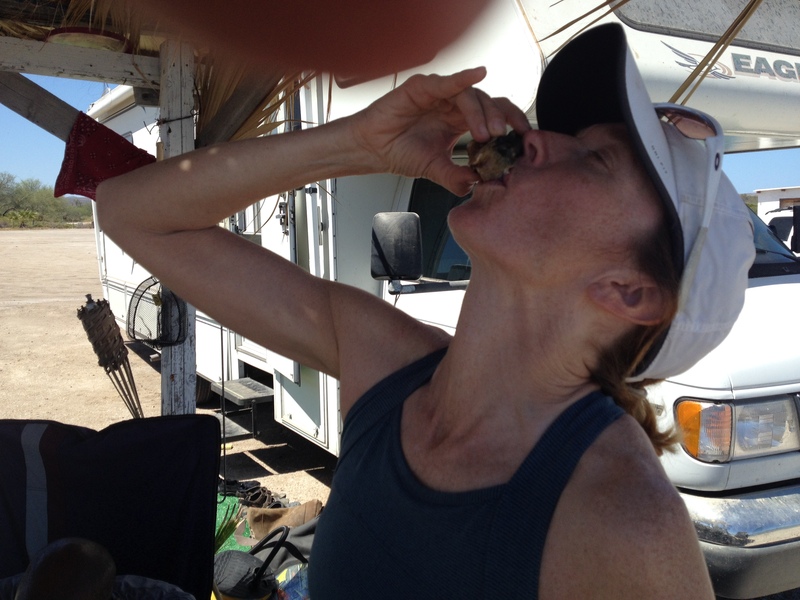 Back to our kayaking day, we returned to shore then Arnold shucked the oysters that I harvested earlier. They were my first oysters and very tasty. Just a dash of hot sauce…looking tasty! After our lovely morning with Arnold we drove over to Santa Rosalia for a little sightseeing, grocery shopping and a quick lunch. The town was first established as a small fishing village and its claim to fame is a church that was designed by Alexander Gustave Eiffel, who also designed the Eiffel Tower. Unfortunately, I wasn’t inspired to take any photos so I can only provide you a link to it on Bajabound. 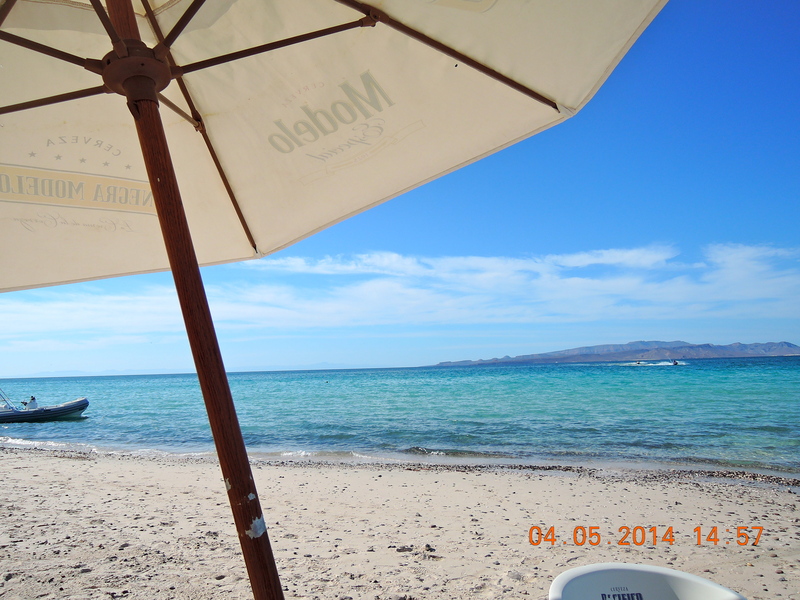 And that was our wonderful adventure in San Lucas and Santa Rosalia along the Baja Peninsula.